The 2011 Edublog Awards nominations are open. I’ve really enjoyed writing this post because I’m sure I don’t tell others often enough how they help me. This is the first year that I knew about the awards, so I am happy to add my nominees, for each one helps me to become a better teacher. It was difficult to choose just one nominee for each category. I hope as you read this blog post, you will meet someone new to add to your PLN! My favorite individual blog is a new one by JoAnn Jacobs. I like blogs that do one thing and do it well. Color Wheel Symphony always makes me ooh and ahhh and smile. It is a place where JoAnn shares her beautiful photography from Hawaii and writes captivating prose to go with it. I always look forward to her posts. Tracy is a thoughtful blogger, a technology integration specialist, and an encourager through Twitter, where she shares resources and retweets about 21st century learning. More importantly, though, she develops and maintains professional friendships. She thinks of individuals and mentions them by name in a tweet when she knows something is relevant to them. She is warm and friendly, and makes my PLN more human with her sweet tweets and comments. Laura is a new blogger, having just started this past June. She is a passionate educator, clever, creative, and funny. I love reading her posts, for, like me, she is a middle school reading teacher. Everything she has written so far has been helpful to me or thought-provoking, so I continue to go back. I have a special place in my heart for the Eagles and their teacher Sheri Edwards. This year my students and I have had the privilege of working together with the Eagles. Currently, we are all writing novels together–her class and mine, and Mr. Boylen’s and thousands of other classes. The Eagle writers are geniuses, contributing to the world, and at this blog you can see them in action. Oh, there are so many to vote for in this category! So many students are stand outs in their classes, and I’m so happy for them to have a worldwide audience. My own students’ blogs are awesome too, but today I nominate Em’s Canvas, which is about the sweetest student blog I’ve seen this year. She’s just five years old, and her mom helps her share her genius with the world. Nancy has a way of identifying a need (or even anticipating a need) and writing a blog post about it. One of the first posts of hers I remember was last January. It was about a snow day her school had (actually it sounded like most of her state). I was reading it on my own Iowa snow day, and I was having so much fun looking at all the resources for snow day activities she had shared. Since then, she has shared resources about hurricanes, tsunamis, tornadoes, and more–many times coinciding with what’s happening in the news. Nancy has vetted all the resources, sharing them just in time for when children start asking questions. As a fourth grade teacher, Nancy also shares many great literacy strategies with her readers. Overall, this is a great resource sharing blog. I love many Twitter hashtags. In fact, I just counted 21 hashtag columns open on my Tweet Deck. (I wonder how many columns one can have open at a time.) It was not easy choosing the best hashtag, but I wanted to share this one. Last summer I learned about the #eltpics hashtag from Chiew Pang and Sandy Millin. 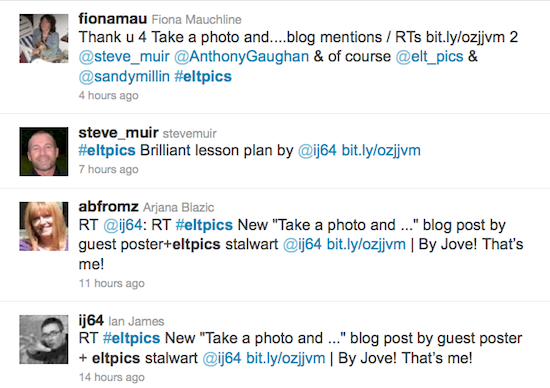 I was involved in a photography challenge for teachers, and they noticed and invited us to participate in #eltpics. (My “thank you” post.) There are over 5,000 Creative Commons licensed photographs for you to use in your classroom, and these aren’t just pictures–they are beautiful artworks from all around the world! You can also contribute your own photos and make it even better. For the last fortnight the theme was parties and celebrations. Starting today, until December 3, folks will be adding pictures to a set called Shadows. Karla is a passionate and smart drama teacher who is busy building a program all by herself in her NSW, Australia, school. Although I am not involved with high school drama, I do read her posts and learn so much for my junior highers. I also try to bring some of her posts to the attention of our high school drama person. I’m impressed that Karla initiated this blog to build her connections with other drama teachers. She didn’t bemoan the fact that she was the lone drama teacher. Instead, she became a global leader by creating the Drama Teachers Network. Without Twitter and my new PLN, I would not even have known where to start with nominations for the Edublog Awards. In fact, I hadn’t noticed the Edublog Awards nominations going on in both 2009 and 2010, even though I was already blogging, having created my Edublogs account in October, 2009. Perhaps in 2009 and 2010, I may have read about the nomination process in a blog post, but I didn’t stop to listen. Twitter helps me to listen to important happenings in education. In addition, Twitter revolutionized my world when I allowed my blogging to become a conversation and not just my one-sided posts. Twitter has helped me build my PLN. Since it is a wonderful forum for amplifying important resources, Twitter makes it easy to pay attention to the voices of my PLN. Yep, I’ve seen all of those things on Kevin’s blog. While participating in the Edublogs teacher challenge last January, I met many wonderful teacher bloggers. Kevin is one of those who was light years ahead of me in using cool media on his blog. He is a musician, writer, poet, artist, and he shares his genius and that of his students with the world. He blogs circles around most of us, so I don’t always keep up with reading all his blog posts. However, there is always a treat when I stop in, and I am sure to learn some tool to make my life easier, more collaborative, more beautiful, or just more fun. Visit! You won’t be sorry! Kevin’s class also has an incredible web page at The Electronic Pencil. Don’t miss it! Perhaps I’m partial because last summer I attended my first online conference–Reformed Symposium 3, which is my nomination for the best unconference. Thousands of people came together to learn and grow. This conference was inspiring and transforming for me as an educator. How delightful it was to spend unpaid professional development time with so many passionate people who wanted to be there. What a great experience! A wonderful community of social studies teachers exists online! (Try #sschat on Monday evenings at 7:00 p.m. ET) When I joined Twitter, Greg Kulowiec and Ron Peck were warm, welcoming, and helpful. I have become just a tiny bit involved in #sschat and the corresponding sschatning.com. The #sschat community is much more than just a once a week Twitter chat. Greg, Ron, Susie, Becky and others are connecting, collaborating and contributing, and making others feel welcome. If you are a social studies teacher of any kind, I would highly recommend joining #sschat (or even lurking about, like I still do). So there you have it. I could go on and on, but I’m going to stop there. These are my nominations for the 2011 Edublog Awards. Thanks to all those who have made this past year one of my best teaching years ever! And thanks for the all of the resources and sites here. I am now doing my little tour of your recommendations. Thanks, Sandy, for making those of us who aren’t ELT teachers feel welcome in the #eltpics community! Kevin, your comment reminded me of “The Electronic Pencil”, which I had not been to visit lately. I went this morning, and, sure enough, I learn something new every time I open your blogs! Today it was Gamestar Mechanic. 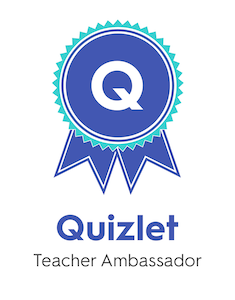 I’ve added a link to your awesome 6th grade class blog in the post above. Denise, thank you so much for the nomination. I am beyond flattered. It brightened my day. Looking through your other nominations made me realize that I have barely begun my journey of finding and using the educator-created resources that are out there! I feel the same way. There is only so much time we have to look at blogs and sort through resources! Yikes! It will be fun to read other nomination posts, and find more vetted resources. Thanks for sharing your blog with the world! Thank you so much for the nomination. You are too kind to me, and your thoughtful words warms my heart. I appreciate all of your nominations here and am honored to be part of your PLN. Thank you for all you do! thank you im o happy yay!!! Thank you for nominating our class blog for the Eddie11 awards.I love writing on our class blog, it is so fun I love it more than reading.On our blog I love making up stories.Thank you. Thank you Mrs. Krebs for nominating us for best class blog. I think that you are very nice for it. Also we all try very hard on our assignments. Thank you Mrs. Krebs for nominating our class blog. This is very exciting! I like being able to type up our blogs because then it is open for people to read. We have been learning about how to take notes (key words, and phrases) then turn them into a summary about what we have just learned or read about. Once again thank you for the nomination! Thank you for nominating our blog, it’s great knowing that. I would like to thank you so much for nominating. My whole class an I really appreciate how you nominated us. I feel really proud and honored. I really like working on our blog. Moistly the fact that we get to meet new people and communicate with people across the world!!! We learn many new techniques on how to keep notes and things about what we learned in class, when we did that and we have learned many new things then we get to have our very own blogs!!!!!!! So lastly thank you very much for nominating us!!! Thanks Mrs. Krebs for nominating use for the eddie11 awards. Our Class is so thank you for you nominating us. We feel proud because of it. I love to work on the blog. If we had a chance to nominate you I would. Thank you for the nomination. We write things on our blogs and we work hard. We wrote about what veterans do for us. What a surprise to open my blog and find eight new comments waiting from my friends in Washington! You guys are awesome, and you are good writers! I was proud to nominate you for best class blog. Congratulations on sharing your enthusiasm for writing and reading with others around the world. thank you mrs kreb for makeing us the best class blog that is cool now my class mates are happy. Thank you for every thing that you did for us and we wrote vary hard on the veterans blog. Thank you Mrs D. Krebs for the nominating us because the class and I are thankful that you said that and we did our best on our blog. You might be in class right now because I just got your comments. What fun to get so many comments on my blog post in one day. Thank you! I enjoyed reading your latest post about the Veteran’s Day ceremony you had to honor our veterans. Thanks so much for sharing with the world. Thank you for leaving a comment on my blog, and thank you for the nomination. My mommy had to explain what that meant. That’s really nice of you. It made me really happy. Thank you for the comment. It has been fun to read all the comments from the students in Ms. Edwards class. The names are familiar from our POS project, so it is good to hear from you all again! I love your avatar. Very sweet! How did you make it? It was a pleasure to be introduced to your blog. Thanks for sharing it with all of us.